Zen is watercolor and watercolor is zen. Grabbed a few quick minutes last night to do this after Hub cut me some flowers and brought them in. He gardens; I don’t, but I think he really loves it when I draw in my breath at something he brought in and immediately talk about mixing colors, hehe. 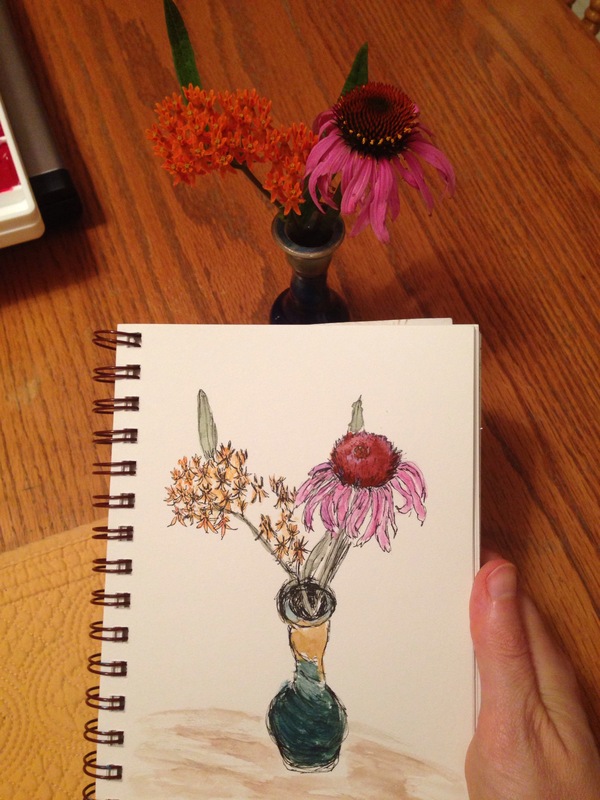 This was done in my journal, not on watercolor paper, and I know the perspective of the vase is way off. But flowers aren’t as hard as they used to be, and I do enjoy drawing and painting them. Obviously, the goal is progress, not perfection, to quote a fellow blogging friend (thanks, Tom). Look at you rocking the flowers now! Woohoo!! Beautiful. And possibly becoming a kitchinesta too. Hope the crab cakes turn out good and you share the recipe ! Lovely. I like seeing your journal and hand in the photo too. Coming out of the shadows and into the light! lol. Thanks Jo. Art has a way of doing that. And you’re doing it well. You really captured the flowers! Perspective, like we’ve discussed before, is hard, but you’re practicing so it’ll be perfect soon. Thanks Kirk! See how perspective strikes again though? Argh! I need to read that boooook. I hope you have a great Father’s Day! Flowers really working well here. The vase looks difficult – awkward shape and tough perspective! Thanks. It was tough! Love the vase but I need to practice purely sketching it, I think. I’m glad you like this! Love it! Can’t wait for our Echinacea to bloom so I can draw one too! Thank you! Flowers are so zen and so much fun to draw! 😀 I hope you enjoy it! Thank you so much, Evelyn! I’ve really been working on my florals. Still need to get the perspective right on the vase, but I feel I’m making progress at least. Thanks again! 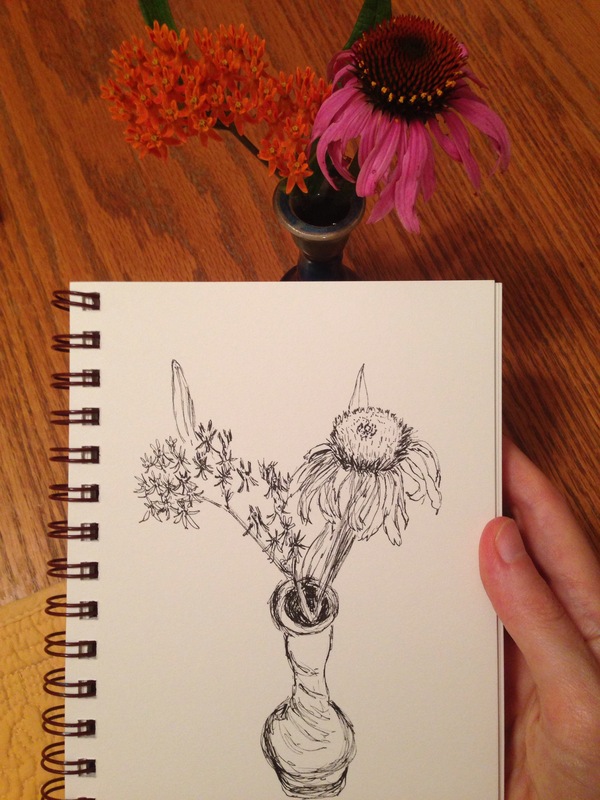 Your flower sketch is great and I liked seeing it before and after you added color. So nice of your husband to bring in flowers for you to draw and paint. I like the way you drew the vase. It gives your sketch added interest. Thank you so much, Carol! I promised myself I’d improve my flowers by summer’s end, so….. at least I’m making progress! Oh wow! Your flowers are looking awesome! I like that you kept the colour version a surprise :-). Thank you! When he brought those in, I couldn’t resist them. Glad you like! Thank you. You make a great point. I’m so glad you like the flower. And thanks for commenting! I appreciate it. Thank you, Ann! I did promise myself I’d be better by end of summer. Let’s hope! Really like your sketch and wash on the flowers, Laura!! Well done. Thanks, Rachel! :)) It was fun.